This is a rather dark episode. We see a group of people wishing a guy “Bad luck”. One of them is holding a laptop and we can barely see that it’s Yui’s website. We see a quick shot of the laptop’s screen which also says “Bad Luck” right above Yui’s usually positive message of “The only way is up”. The next day, Izumu is writing about their experiences on her computer. It looks like she’s actually writing on Yui’s website. 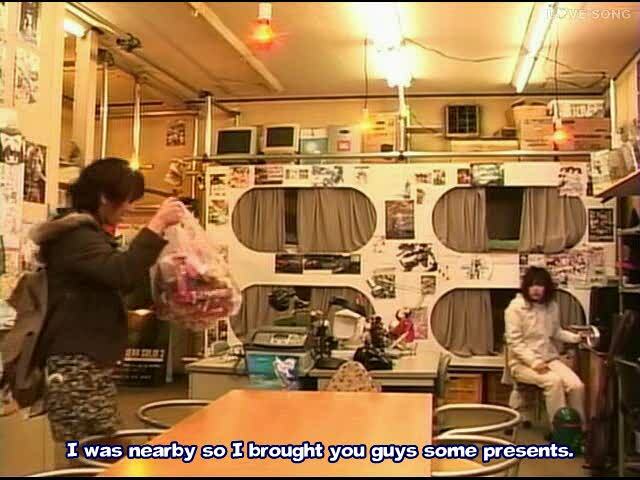 Akira comes into the shop and Izumu hides the website. Akira just bought two huge bags worth of Umaibos and she wanted to drop them off for Izumu and the guys before heading off to the maid cafe, Akanechan. Hey, wow, Taiko falls in love. Hard in love. 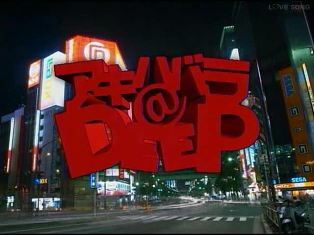 The team gets lead to a plaza in Akihabara where a group calling itself Shuyuukai (Commitee of Concern for Akiba’s Future) and lead by Akada Shunichiro. Akada starts to deliver a speech concerning who being a withdrawn otaku is wrong. As he’s delivering his speech, an all-girl band interrupts his speech with their particular brand of emo death punk music. Akada tries to appeal to the band to let him finish. Kaira, the leader of the band ignores his please of gaining understanding through talking, Akada’s group is forced to back down. As the band plays, Taiko becomes attracted to Kaira as she sings. Who to feel sorry for? The rat or the phobic Box? After a sad start to this episode, Akira uses her winnings from the cage match to rent a small office space in Akihabara. She convinces the team to start a business. Page gets the idea to have the Akihabara@DEEP company act as “troubleshooters”. They’ll help solve any problems they may have in Akihabara. Yui had told them that the reason why she helped others was that “In the process of saving others, we save ourselves“. With everyone on board with the idea, Akira, Box, Daruma, and Taiko head out to hand out flyers to advertise the company. Akira is the only one handing out flyers because any male that passes by the group ignores the guys. That is until a girl asks for a flyer from Box. Kaneda’s bike, yet another reason to like this show. After the success the team had in fighting of the gang who were assaulting the otakus of Akihabara, Akira’s fame rises much to the envy of the rest of the team. Even when Page, Box, and Taiko try and tell other people that they helped, no one believes them, prefereing to believe that Akira the Comabat Waitress did. After the restaurant closes down for the night, Akira wants to hear what the rest of the team has been up to. She’s dismayed to find out that they haven’t done anything. After chasing the guys out, she complains to about them to Yui in Yui’s chatroom. since they haven’t done anything else other than being their regular otaku selves, she’s disappointed. Yui tells her not to judge people and suggests that if she let them know more about her, then they could surprise her. After reading about this live-action show, I finally got around to checking it out. And I’m glad I did. There’s a great enthusiasm and sense of humor that comes from the show. There’s also two otaku-esque reasons: Akira the combat waitress and the bad guy dresses like Char (not all of the time). The only thing that would make this show better is if someone dressed up as Goto or Kanuka. Even Ota would’ve been great.